For parents (and others) who are concerned about the excess it’s helpful to consider the root causes. For students aged 17-22 there are probably finite reasons for habitual binge-drinking. There is most likely some percentage who suffer from alcoholism (a condition which has no age limitation.) But for the rest of the students it could be issues of social maturity and/or boredom. For the socially immature, they may be best served in a community college (living at home) for a while, or at a very small school at which social interactions are less daunting and actively encouraged. The socially immature should be encouraged to step away from the keyboard and find people with like interests (e.g., clubs, religious groups, teams, performance groups.) Even if this was all encouraged and done in high school, some people are never quite comfortable socially. For them it might be best to talk about managing their intoxication. With enough coaxing and patience you might be able to come up with a plan that helps the student avoid dangerous levels of drunkenness. (i.e., “When I no longer can hear the music, it’s time to stop.” or “I will always eat and drink water while drinking booze.”) We may never love underage binge (or any other kind of) drinking, but we do want our children to learn to be responsible and to care for themselves. There’s nothing wrong with letting off steam, making a fool of oneself, and learning one’s limits. 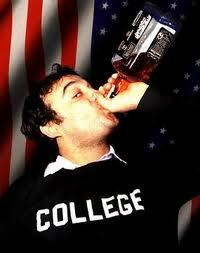 But there is something troubling about defining one’s college experience with a series of blurry drunken episodes. One of the simplest and time-tested methods to ensure that a person gets the most they can out of an experience is for them to have a financial interest in the endeavor. Working during every school break, or at school not only breaks up any boredom, it boosts social maturity and self-esteem. It also helps (anyone at any age) to consider the value of what they’re paying for when they are paying for it themselves.